On May 7, 2017, Texas Governor Greg Abbott, sent a clear message of rejection and oppression to the immigrant community, signing S.B. 4, the “show me your papers” bill into law. This short-sighted law, which is scheduled to go into effect on September 1, 2017, will surely cause greater discrimination and profiling, leaving local communities less safe in the process. More importantly, this law tells members of the immigrant community, people that work hard to support their families and achieve the American dream, that they are second-class individuals. Not all hope, however, is lost. If law enforcement wants to search your home, you have the right to deny their entry unless they present a valid warrant. If the warrant is not signed by a judge, it is not valid. Though S.B. 4 was signed into law and is scheduled to go into effect, advocates have challenged the law in court. 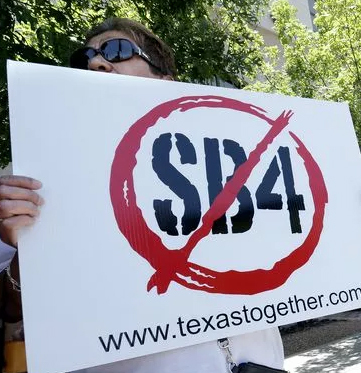 Now, those anti-immigrant Texas politicians must answer to the U.S. Constitution. The Constitution was designed to create a system of equality and justice regardless of a person’s race, color, and national origin. This system is what truly makes America great. Immigrants are not second-class individuals. Don’t leave your future and the future of your family in the hands of nonprofessionals. If you have questions regarding your rights, please do not hesitate to schedule a consultation.